Most people agree that I am quite striking with my snow-white coat, perky ears and curled tail. My early relatives, obviously, were of the Spitz variety and some folks still refer to me as a Spitz. I am lively, alert, intelligent, easily trained and eager to please. My breed comes in small (toy), medium (miniature) and large (standard), depending on what your taste is and what kind of space you have for your dog friend. No matter what size I am, I will have to depend on you to help me with my coat. It is very thick and will have to be brushed regularly to keep me looking healthy and pretty. A fully grown minature is between 11 and 14 inches tall (27.9 to 35.6 centimeters) and weighs 10 to 20 pounds (4.5 to 9 kilograms). Toys are even smaller. I am a Standard. When fully grown, I am between 15 and 19 inches tall (38.1 to 48.3 centimeters) and I weigh between 18 and 35 pounds (8.1 to 15.8 kilograms). We have no American Eskimo Dog Breeders listed at this time. 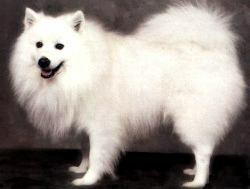 Click here to place your American Eskimo Dog Ad!